David Scholes may not be a familiar name in either the UK or the US, but his reputation as Australia’s best writer on fly fishing is one with which I find it hard to argue. The Break O’Day was to Tasmania as the Bourne was to Hampshire and this book has echoes of Harry Plunket Greene’s Where the Bright Waters Meet; unsurprising perhaps, since the latter volume inspired this. 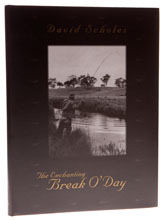 Apart from its wonderful name, I only know the Break O’Day by reputation, but to read this book is to understand how it is that all rivers run their path to oblivion. Even if this once charming little stream hasn’t quite run its course into the sands of time, David Scholes’ writing conveys how he and his favourite river have grown old together. There is regret, but there are also some accounts of fine days past and even if this book doesn’t quite hit the heights of what the author is capable of achieving, it is definitely bound to become a classic. The design and presentation are absolutely beautiful and the line drawings by Trevor Hawkins are among the best I have ever seen.